Our NJ appellate lawyers handle civil and criminal appeals from cases decided in the Superior Court of New Jersey, and civil appeals from cases decided in federal courts for the District of New Jersey. At the appellate level, the aim of the appellate lawyer is to be persuasive and to effectively assist the appellate courts in accomplishing their review and decision-making objectives. In accomplishing this goal, the appellate practitioner must be proficient in several key areas, including, but not limited to: brief writing; oral argument; and rules of appellate procedure. Knowledge and experience in the appellate process are central to attaining such proficiency, as they would be with respect to any other field of law. “The pen is mightier than the sword.” There can be little dispute that communication through the written word is an art, and appellate brief writing is no exception. The brief is the most critical element of an appeal; therefore, brief writing skills are extremely important. In composing a brief, the appellate practitioner must know which questions to raise, which arguments to pursue, and which facts to stress. He or she must determine the most significant legal issues worth pursuing on appeal and present only the strongest arguments. Apart from the substantive differences between argument at trial and on appeal, the technique of argument in each instance also differs. Time restraints in the appellate court are, of course, much stricter than in the trial court. A trial lawyer may take days or weeks to persuade a judge or jury. In a typical oral argument, counsel is limited to only 15-20 minutes. Thus, the effective appellate advocate must reduce the case to its bare essentials, i.e., those few core points which will determine the outcome of the case and can be presented in just a few minutes. Broadly stated, appellate practice involves the practice of law before appellate courts. The function of appellate courts is, of course, to review the decisions of lower courts to determine if reversible error has been committed. Such review involves the interpretation and application of the law to a given set of facts. Time is of the essence in preserving appellate rights. The failure to file a timely notice of appeal may serve to bar a litigant’s appellate rights. Also, it is important to understand the types of orders that are automatically appealable as of right (final judgments that dispose of the entire case) versus orders appealable only by leave or discretion of the court (interlocutory), and the standards of appellate review. What is the time to file an appeal in a civil case? In civil matters before the Superior Court of New Jersey, New Jersey Court Rule 2:4-1 requires that a notice of appeal be filed within 45 days from the date a final judgment or order is entered. Under certain circumstances, the time to appeal may be “tolled” and/or can be extended upon a showing of good cause. In federal cases, Federal Rule of Civ. Procedure 4 requires appeals in civil matters be filed within 30 days after entry of the judgment or order. Our New Jersey appellate attorneys promptly file a notice of appeal outlining the legal issues to be addressed, obtain and thoroughly review the trial court transcripts, and prepare an appendix and legal brief tailored to the specific arguments on appeal. Persuasive Legal Writing. To succeed on an appeal, it is critical to retain an effective appellate advocate to explain, in plain English, how trial errors undermined the process and caused an unjust result to occur in your case. The brief outlines the story, and must capture the attention of the appellate judges from the beginning. In many cases, the trial court or jury simply got it wrong – whether the jury was given misleading instructions, the trial judge made erroneous evidentiary rulings, overlooked case law, or simply misinterpreted controlling case law. Trials Superior Court of New Jersey: Interlocutory orders and final judgments issued in civil litigation matters tried before the Superior Court of New Jersey – Law Division, and Chancery Division. State Administrative Agency Appeals: Final Judgments issued in matters tried before various NJ administrative agencies. US District Court Appeals: Final judgments issued in matters tried before the United States District Court for the District of New Jersey. In addition, our firm handles criminal appeals from decisions issued by municipal courts in New Jersey including DWI offenses, and appeals from decisions of the Superior Court of New Jersey, Criminal Division. 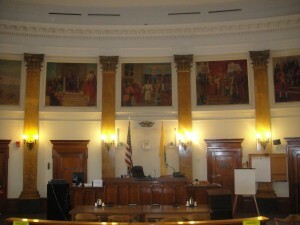 Our experienced NJ appellate lawyers are ready to help. Contact our NJ appellate attorneys today and receive an initial free telephone consultation.